“You’re just great mates, aren’t you?” asked Piers Morgan last Thursday evening. The close friendship and sense of family these brothers have for each other is something The Jacksons wear on their sleeves. “Here’s the secret I’ve unraveled from interviewing you” Morgan continues “…you’re no more dysfunctional than most other families I know. In fact, if anything, you’re less dysfunctional”. As The Jacksons prepare to head out on the road again, the bothers are opening their hearts to fans the world-over. “We knew that he knew what to do” Jermaine said of his brother Michael. As the interview continued, it was evident that the Jackson brothers had confidence in Michael’s ability to manage all the pressures and responsibilities that came with being a superstar. “They don’t know us” says Marlon, as if to affirm that the Jackson family remains strong, even when facing a lifetime of challenges, like loosing a very dear friend and brother. 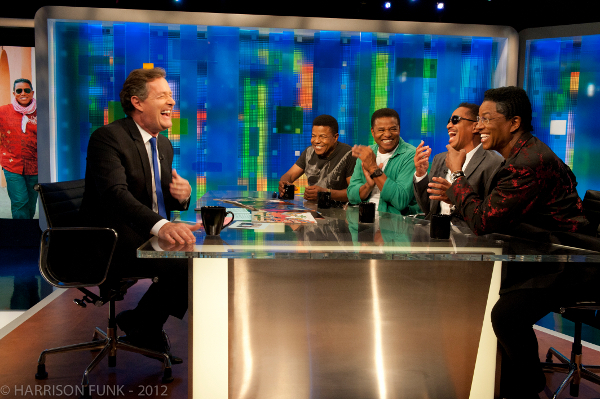 The Jacksons also talked about the future – The upcoming UNITY Tour. “I want you back” said Jackie, naming his favorite song. The Jackons will be performing classics like”I’ll be there” and “Maybe Tomorrow” which promises to make for an amazing show. Tonight, Katherine Jackson will be joining Piers on the air. See a preview for tonight’s interview here.